With food prices on the rise, shopping for a family can be expensive. But you can still share a home-cooked meal cheaply, if you choose your ingredients carefully. Give one of these budget family meals a go — they all cost less than £5 to make. 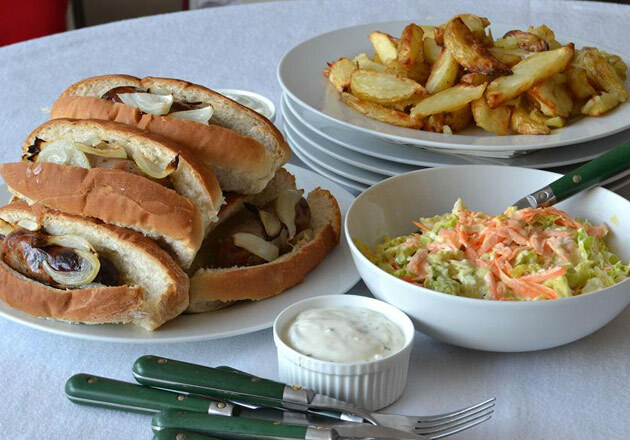 The Saturday Night Feast: Hot Dogs with Potato Wedges, Sour Cream and Chive Dip and Coleslaw: Cost: £4.78. The trick here is not to use very cheap sausages — you'll still keep the price down using good quality, butcher's-style sausages, because you're saving money by making your own potato wedges, coleslaw and dip. Serves 4. 1. Preheat your oven to 220°C. Cut the potatoes (don't peel them) into thin wedges and tip into a large roasting dish. Drizzle with olive oil and add a pinch of salt. Bake for about 15 minutes, occasionally giving them a stir or shake so they don't stick to the bottom. 2. When the potatoes have had their first 15 minutes, arrange the sausages inside another, smaller roasting dish. Scatter the onion slices around the sausages and slide into the oven with the potatoes. Cook everything for another 30 minutes. 3. Meanwhile, finely shred the cabbage leaves, grate the carrots and slice the spring onion. Tip into a serving bowl and add enough mayonnaise to bind it all together. 4. Next, pour the soured cream into a small dish and stir in the snipped chives. Take to the table with the coleslaw. 5. When the sausages and potatoes are golden and cooked through, split the hot dog rolls along the top, place a sausage into each and spoon over some of the onion slices. Serve with the dip, coleslaw and the crisp potato wedges. We used cheaper but juicy and flavourful chicken thighs for this recipe which is low on cost but big on flavour. Serves 4. 1. Preheat the oven to 200°C and heat 1 tbsp olive oil in a non-stick frying pan. 2. Fry the chicken thighs, in batches, for about 4 minutes each side, until golden and starting to turn crisp. Arrange in a large roasting tray (you might need two smaller trays). 3. Tip the potatoes around the browned chicken and scatter over the garlic cloves. Sprinkle with salt, drizzle with olive oil and roast for about 35 minutes, until the chicken is cooked through and the potatoes are tender. 4. Quickly boil the peas and the carrots in separate pans, until cooked (5-7 minutes). 5. Remove the chicken and potatoes from the oven and scatter with parsley. Serve with the soft garlic cloves and vegetables, spooning over a little of the roasting juices over the chicken. You can have this dish on the table in around 10 minutes, and it's incredibly cheap to make, too. Serves 4. 1. Boil the spaghetti in slightly salted water. 2. Slice the bacon into small chunks and heat gently in a dry, non-stick frying pan. The bacon will start to release its fat. Keep frying until slightly browned and crisp. 3. Add the garlic and sliced mushrooms and fry for 2-3 minutes, coating everything in the bacon juices. 4. In a small bowl, whisk together the egg yolk, Parmesan and cream. 5. Once the spaghetti is cooked, lift it with tongs and drop into the bacon mixture, tossing it together. 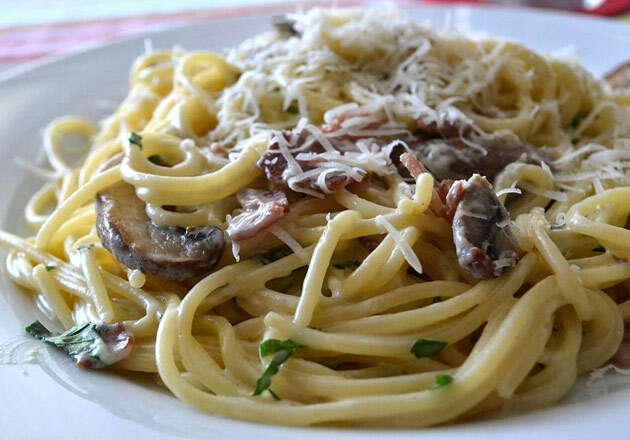 Turn off the heat and immediately pour over the cream mixture and slosh in a little of the pasta cooking water to thin the sauce. Toss well with the tongs, season with black pepper and scatter over the parsley before serving. 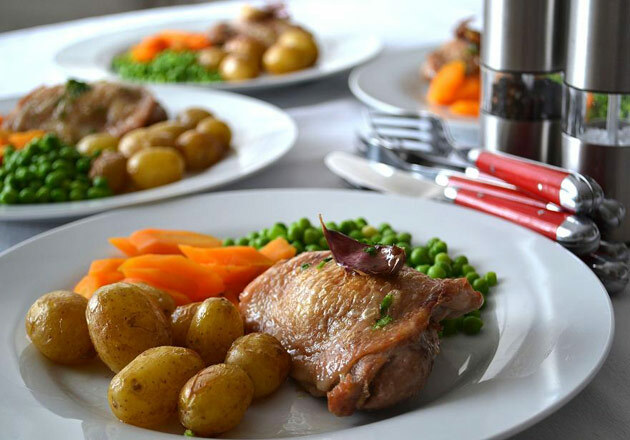 What are your favourite economical family meals?